Once upon a time, Samuel Swerling, a World War II veteran and inventor, decided to build a park. It would be filled with trees trained to grow in such a way that children could easily climb them. To this end, he bought two acres of land, hired Alonso Hannah, a one-armed arborist, and began to turn his dream into the reality. After five years, Alonso and Sam had created a small, privately-owned park in a big publicly-run city. Sam married Ghita, bought an apartment across the street from his park, and had five children. People fell in love at the Samuel Swerling Park. Painters painted pictures; dogs chased balls; pretty girls basked in the sun; and time stood still. Most of all, though, children did what the park had been built for them to do: They climbed trees. The narrator of this book is one of Sam's climbing trees. He thrives on human contact, and in his long and happy life, he has had few disappointments. Lately, however, he is being subjected to life-threatening injuries by Jarvis Larchmont, a power-hungry politician who was thrown out of the park for bullying when he was twelve-years old. Time passes. Sam’s grandchildren, particularly Esther Swerling, are now in charge of the park. Esther is young, beautiful, and like her grandfather, an inventor. She is also ferociously protective of her heritage. When a hurricane floods the area, she and her family provide food and shelter for those seeking refuge from the storm. At the same time, Jarvis Larchmont is put in charge of the Department of Parks. Still bitterly resentful at having been thrown out of the park as a child, he joins forces with Eco-terrorists to destroy Sam's creation. Suddenly, our narrator and his fellow climbing trees are separated from people. Separated from all that they know and love. Separated from children. They cry...and they begin to die. Then Esther, her friends, and her family organize. And they fight back. Today – Arbor Day – is a most fitting time for me to share my thoughts on author Shelly Reuben’s latest release, MY MOSTLY HAPPY LIFE: An Autobiography of a Climbing Tree. In Reuben’s new book, which also hits bookstands today, her narrator for this fascinating tale is a tree. 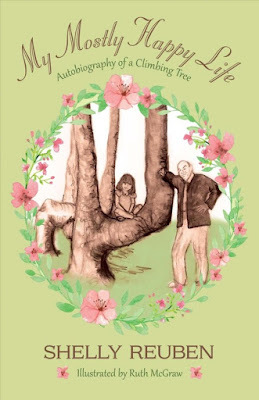 She gives readers a unique perspective of a tree’s life in a park and how we humans interact with them. This is not a supernatural story where the tree talks to people, but a story where readers get to know the tree’s feelings and outlook on life in the park. This story is filled with highs and lows, sorrow and happiness, and a whimsical outlook that will have you smiling despite yourself. Reuben has a exceptional way of bringing the tree to life as a narrator. Reuben’s writing is entertaining and captivating. She pulls you into the story and makes you feel you’re in the middle of the action. The story flows smoothly and at a good pace. It holds you spellbound until the very end. I have never come away from any of Reuben’s writing without feeling more relaxed and uplifted than when I started reading. Her writing is refreshing and intoxicating leading you to see a more fanciful side of life. Illustrations by Ruth McGraw enhance the story. McGraw’s beautiful drawings highlights this amazing adventure Reuben takes readers on. Don’t be surprised after you read this delightful story if you start looking at trees in a whole new light. Thanks for stopping by today. Do stories make you stop and think of how we as humans interact with other creatures and even objects? Did you have a climbing tree you enjoyed as a youngster? It sounds absolutely delightful. I suspect that Ents have been my all time favourite character to date and perhaps, just perhaps, another tree will challenge that position in my heart. What an interesting idea for a story and protagonist. I really respect the way Shelly Reuben explores so many genres and different types of books as she writes. Thanks for sharing, Mason. What a refreshing idea for a story and such a unique POV. What a wonderful premise and uniques story. I want to read it now. If trees could talk, I bet they'd have a lot of stories to tell! From your review, I think this would be a sweet, uplifting story to read. I love the title; it says how much the book reflects real life. Thanks for posting about it.